Drawing in pencil and ink of Government House in Calcutta from Esplanade Row by William Prinsep (1794-1874) dated c.1830s. When Marquis Wellesley became Governor-General of Calcutta in 1798, he decided that the existing Government House was not a suitable building for his position and needs. The new Government House was designed by Charles Wyatt of the Bengal Engineers. 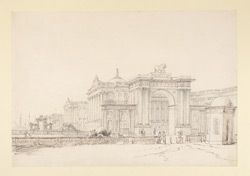 Four large ceremonial gateways marked each end of the carriageways on the north and south façades and were based on Robert Adam's archways at Syon House in Middlesex. The gateways have three sections; while the inner section is topped by a figure of lion and the outer ones are decorated with figures of sphinx. In the front of the gate there is a small domed sentry box.